Overview: when substances take part in a chemical reaction, atoms or ions are rearranged. However, the total number of each type of atom (or ion) must remain the same – we cannot create or destroy atoms in a chemical reaction, we can simply change what they are joined to. 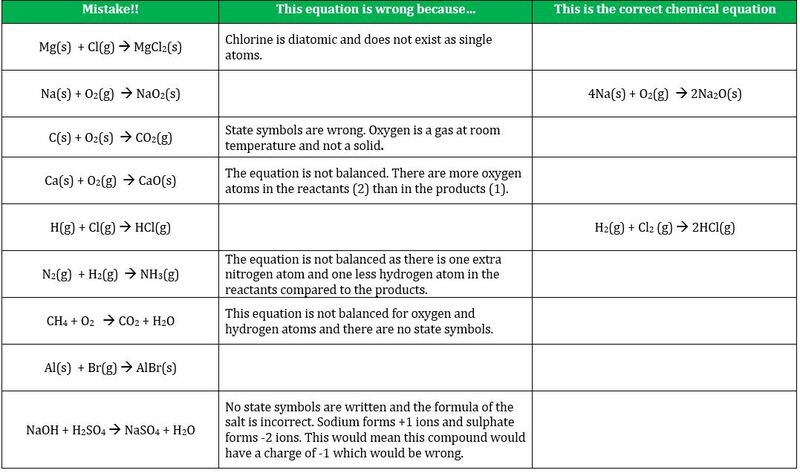 To understand chemistry, students must be confident in representing chemical and physical changes with chemical equations, and this requires lots of practice and exposure. Students also need to understand where the mass of an atom comes from, i.e. the nucleus. A great starting point is to ask students what they think will happen to the mass of iron wool when it is burnt in air. Many will incorrectly say the mass will decrease (or they may argue mass will remain the same, quoting law of conservation). Record the mass of some iron wool using a top pan balance. Then, using tongs, heat the wool in a Bunsen flame. Record the new mass. Ask students to explain the apparent increase in mass. How is this possible? Write a simple equation to represent this reaction and then show students why we need to balance an equation and add state symbols. A nice set-up from the RSC is here. You could represent this equation using molymods too. Resources to teach chemical formulae are here. This video is an excellent introduction to the importance of stoichiometry when reacting substances. A sufficient BANG is only produced when one part oxygen is mixed with two parts hydrogen. Students must have a good understanding of why we need to balance chemical equations before we introduce coefficients and mole ratios. The human population on Earth is increasing year on year. What is happening to the mass of the Earth? Does 1 gram of sodium and 1 gram of neon have the same number of atoms? What would happen to the mass of a piece of magnesium if it was burnt in air? Use a balanced symbol equation to explain your answer. Why does this not contradict the law of conservation of mass? Why do chemists use empirical formulas?